The reject module RR 895-030 is an option which can be combined with the bundle scanner RS 893 and the stacker unit RA 894-030. It adds flexibility to the bundle feeding scan process by returning or retracting the rejected documents. The RR 895-030 consists of the Reject Tray and the Retract Bin. The scanner RS 893 can send any documents it rejects to the Reject Tray instead of the RA 894-030 stacker. In case customers forget to remove rejected documents, these can be securely deposited in the lockable Retract Bin. Documents can be put directly into the Retract Bin without being exposed in the Reject Tray, if required. The shutter of the RR 895-030 is opened and closed under control of the RS 893 application program. 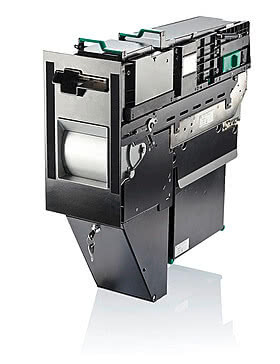 When the RR 895-030 shutter closes, any documents remaining in the Reject Tray and not retrieved by the user are stored in the Retract Bin. The mechanical integration of the RR 895-030 is fully compatible with the earlier RR 895-000 model.